Throughout the year, we will try to keep this post up to date with all of the latest discs that have been or will soon be introduced in 2019. So far, we only know of one new disc that will for sure be released in 2019. In February the Axiom Pyro was PDGA approved. This new disc will also be released in a new plastic blend called Prism plastic. Pyro – The Pyro is a straight to overstable midrange disc. The disc has been teased to be released sometime this summer and will be featured in Axiom’s new Prism plastic blend. Prism plastic is supposed to be ultra-durable, and feature “a beautiful array of multicolor translucent core and rim combinations.” The assigned flight numbers for the Pyro are 5/4/0/2.5. Discmania sent shock waves throughout the disc golf world on February 14. They announced a new manufacturing partnership with Latitude 64 and Yikun. Previously, Discmania’s discs were exclusively manufactured by Innova. Innova will still manufacture discs for Discmania, but they won’t be alone. So now, Discmania will have 3 seperate “series” of discs. All of their previous discs and new molds made by Innova will be considered Discmania Originals. The Discmania discs made by Latitude 64 are part of the Evolution series, and Yikun manufactured Discmania molds are part of the Active series. So far, the only new discs from Discmania that have been PDGA approved are the DD3 and Instinct, but several other discs from the Evolution and Active series have been announced. DD3 – The Discmania DD3 was PDGA approved and released before the new partnerships were announced. The DD3 was initially released as a tour fundraiser disc for Eagle McMahon in Swirly S-Line with the nickname, “Cloud Breaker.” The DD3 is a high speed driver that offers a long stable flight. Instinct – The Discmania Instinct is the first disc to be released in the Discmania Evolution series. It is a straight/stable fairway driver that is set to be released in April. Method – The Method will be the first midrange in the Evolution series. It is set to be released in May. Link – The Link will be the first putter disc in the Evolution series. It is set to be released in June. Enigma – The Enigma will be the first distance driver in the Evolution lineup. It is set to be released in July. Discraft has also already made waves this year. Paul McBeth joined team Discraft this year, and we are already seeing new molds as a result of that move. Luna – The Discraft Luna was first released as Paul McBeth’s new prototype putter. It is a beadless and stable putter available in a tacky blend that is a little different than Discraft’s standard Jawbreaker plastic blend. Kong – The Discraft Kong is also a new Paul McBeth specialty disc. It is a high speed overstable driver. Some speculation has been made that the Kong would be an attempt at imitating the Innova Destroyer, but from how McBeth has used it in tournaments so far, it looks like the Kong is more overstable. 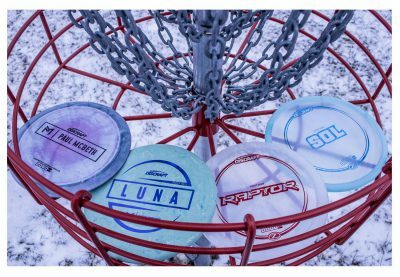 Raptor – We don’t know much about the Discraft Raptor yet other than it is a fairway driver that is rumored to be pretty overstable. Sol – The Discraft Sol is the stock run of the 2018 Ace Race disc. This disc was a popular midrange disc that is great for disc golfers of all skill levels. We have not heard about any new releases from DGA for 2019 yet, but we will update this post when we hear about something new! So far, we only know about 3 new disc molds that are set to be released by Dynamic Discs. Raider – The DD Raider is a new high speed distance driver that has recently been PDGA approved. It is rumored to be a little more overstable than the DD Sheriff. Vandal – The DD Vandal will be the Dynamic Discs disc in the 2019 Trilogy Challenge, which means the stock release will not be available until at least this fall. The Vandal will be a fairway driver that is supposed to be great for all skill levels. It has been described as being a longer flying DD Maverick. Guard – The new Dynamic Discs Guard is a deep dish putter. It has been described as being a beadless Lat 64 Dagger. Gateway seems determined to prove that they are more than just a putter manufacturer with two new control drivers recently PDGA approved. Blade – The Gateway Blade is a new overstable fairway driver. Judging by the flight ratings it looks like it could be similar to an Innova Thunderbird. Spear – The new Gateway spear is a straight flying fairway driver that offers more stability than the Blade. Our big news last year was that we began a partnership with Innova to manufacture our own line of discs. In 2018 we released our 8 initial molds, and we already have a few lined up for 2019 that I can announce now. Emperor – The Emperor is our new high speed distance driver. We came out with an initial release in I-blend that was part of the Las Vegas Challenge player packs. Our stock release will come out in the coming weeks. The Emperor is designed to be similar to the Innova Destroyer, which adds a little more stability to our high speed driver line. Ra – The Infinite Discs Ra is our new overstable midrange. It features a flat top and a beaded rim. It is a great choice for facing the wind and when you need an overstable fade. Sceptre – The Sceptre will come out later this year. It is going to be an overstable fairway driver similar to an Innova Firebird. Scarab – The Infinite Discs Scarab will be a new putter in our lineup. It should be similar to the Infinite Discs Myth, but with a little more glide in the flight. Innova already has a few new releases in the works for this year, including the new Lion Midrange which was available in a special Las Vegas Challenge edition during that event. Lion – The new Innova Lion is an overstable and beaded midrange disc that features a flat top. We don’t know a lot about the specifics yet, so we are excited to try this one out when it has a stock release. Corvette – The Corvette is the newest 14 speed driver in the Innova lineup. It looks like it should be a pretty stable flyer with an impressive glide rating of 6. Firefly – The new Innova Firefly has already gotten a lot of hype. It is the new signature Nate Sexton putter and it is featured in a brand new plastic blend called Nexus. Recoil – The new Recoil is a 12 speed driver that features an overstable flight. Judging from the numbers, it looks like it is designed to be a slightly slower Ballista Pro. Catch – This one is a bit interesting. Latitude 64 recently announced a new Ultimate Disc called the Catch, but it was recently announced that the Catch was PDGA approved. We will watch for more info on this. Legacy Discs recently released their new disc the Recluse, but beyond that we are unaware of other discs that will be released in 2019. Recluse – The long awaited Recluse from Legacy Discs was just released. The Recluse is a very overstable midrange that features a big bead. It is designed to fight the wind. Mint Discs has been a one disc show for a while now with their very popular fairway driver, the Alpha, but a new disc has recently been PDGA approved! Bobcat – The new Mint Discs Bobcat will be a slightly overstable beadless midrange disc. We are excited to finally see the second disc in the Mint Discs lineup. As always, MVP is sure to have a large assortment of new plastic types and limited edition stamps to feed the collector frenzy. For actual new disc molds, the Deflector is currently the only disc we know of that is currently in the works. Entropy – The MVP Entropy has been in the rumor mill for a while, but it was recently PDGA approved. It is supposed to be the long awaited overstable putter in the MVP line. Last year Prodigy saw greate success releasing the “V2” series of their “H” series. It looks like they will take a similar approach in 2019, but this time they are updating their “D” series. Already they have had the D1 Max, D2 Max, D3 Max, D4 Max, and D5 Max PDGA approved. These are designed to add a little more distance to the original D Series. D1 Max – The D1 Max is the first disc in the new Max lineup to be released. It features a slightly smaller rim than the D1 and a smooth profile. D2 Max –We anticipate this one to be similar to the other Max discs–a slightly smaller rim of the original. D3 Max- We anticipate this one to be similar to the other Max discs–a slightly smaller rim of the original. D4 Max- We anticipate this one to be similar to the other Max discs–a slightly smaller rim of the original. D5 Max- We anticipate this one to be similar to the other Max discs–a slightly smaller rim of the original. Our friends from the Southern Hemisphere continue to produce great discs, and they have already added another disc to their lineup in 2019. Huia – The new RPM Huia is a stable to overstable fairway driver. We at Infinite Discs were even lucky enough to get our hands on a few with Prototype stamps that are currently still available in Atomic plastic blend. Westside continues to put out excellent discs in their lineup in fantastic trilogy plastic blends. Gatekeeper– The Westside Gatekeeper will be the newest Midrange disc in the Westside lineup. It will be a straight to overstable midrange designed to hold whatever line you put it on. It will be included in the 2019 Trilogy Challenge. Gatekeeper link in this article leads to Anvil page (https://infinitediscs.com/Westside-Anvil). Thanks for compiling this list – it is nice to have a go-to reference for all the new discs. Don’t sleep on the Pioneer from Lat 64. Good disc to try/buy for 2019.